An architectural firm should have a site that shows off the beauty it’s capable of creating. That site should also be able to be found online. This was the dilemma of Sears Gerbo when they came to Anchor Wave. They knew that they were creating world-class architecture, but what they weren’t doing was showing it to the world. The solution was two-fold: create a clean, modern site, and market it using the latest digital marketing techniques. Through an analysis of the architectural market, we were able to build a unique site, that offered something very different in the architectural community, and a marketing plan that put that site in front of the right people. Through our partnership with Sears Gerbo we were able put their work where it needed to be, so that they could focus on architecture, and not worry about marketing. Since Sears Gerbo Architecture launched their new site and digital marketing program, they’ve seen a traffic increase of almost 450%! Even better, they’re getting higher quality traffic, and the potential clients that visit their site spend longer there. Once Sears Gerbo Architecture’s site was built and filled with great content SEO ensured it could be found. Their onsite optimization package made sure they were being picked up by search engines, and ranking as well as possible. This final piece helped them increase their site visitors over 4x! 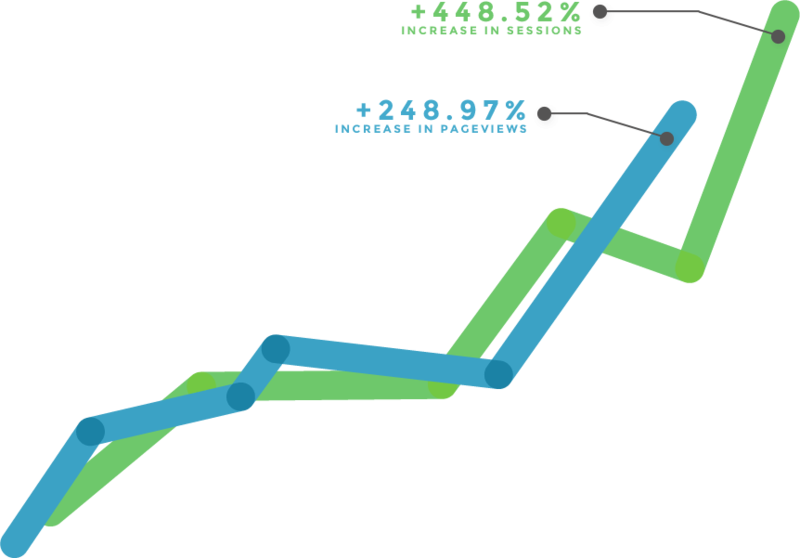 From 8,000 to 23,000 new user sessions – Nearly 3x increase in unique visitors! Through blog posts, and website content, Sears Gerbo Architecture brings in more leads. Anchor Wave’s content is carefully crafted to establish Sears Gerbo Architecture as thought leaders, and convert more site visitors into leads. And the content is interesting! Because their site is filled with great blog posts, search engines know that they’re relevant, and potential clients know they’re worth contacting.